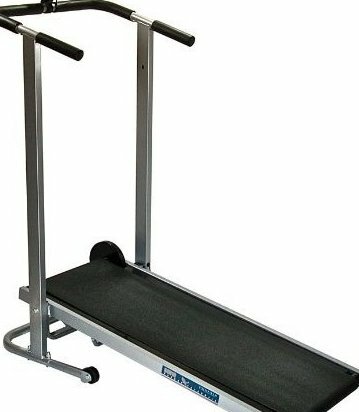 Manual treadmill with heavy-duty weighted flywheel and 41.5-by-13.5-inch belt Single-button electronics display tracks speed, distance, time, and calories. Lets you achieve maximum walking/jogging speed via self-powered workout. Folds and locks in upright position for storage; 250-pound maximum weight limit. Measures 46 x 50 x 21 inches (W x H x D); 1-year frame warranty.